It has always been in our interest that our Mongolia horse riding tours support conservation and community in the places we travel from and through. The Darkhid Valley has been the home valley of our horses for nearly two decades and has become the staging area of our horseback expeditions. 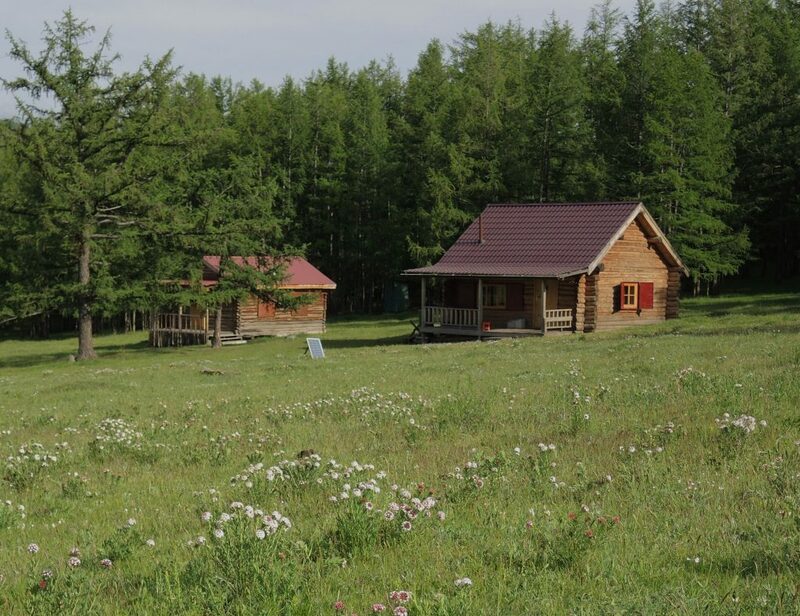 It is also home of the herder home stay where guests can experience the daily life of a Mongolian herder family, and contribute to local incomes through their stay. As the city is growing and more people move into the outer districts, or build summer homes, the valley has become more populated. But as our guests know, despite more fences and buildings along the way, the staging area with our cabins, nestled into the larch forest across the winter camp site and horse corrals, still remains a little retreat of peace and scenic beauty. After all, this was a wild valley only three decades ago. Yadmaa, the caretaker of our herd and host of the home stay, sometimes speaks of these times when he would see bear tracks and wolverine in the valley. These times are gone, but it is still important wildlife habitat. We have seen roe deer, red deer in higher elevations, lynx in the forest, and marten on the scree slopes up the valley. In winter time, a multitude of tracks in the snow gives away the presence of many small mammals – mice, squirrels, chipmunks, and more. And of course, there are wolves, at times. While there were fewer buildings, fences and vehicles in our early years in the valley, there was also a big sore in the landscape. When the road up the main valley was built years ago, a gravel pit had been created. And over time, it had become a garbage dump. Not only was it unsightly. With groundwater levels rising after summer rains, this would turn into a serious public health risk. 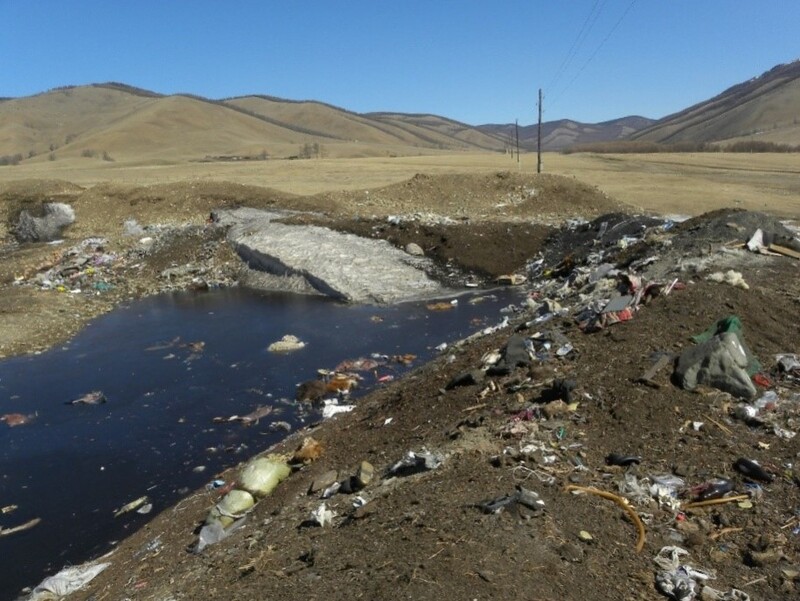 Rubbish and animal cadavers were submerged in water. And all along the valley, herders and summer residents would get their water from the creek into the aquifer of which the contaminated ground water seeped. Anybody involved in environmental work is familiar with this. It mostly isn’t spending time in pristine nature, observing wildlife. Its witnessing degradation of the environment, in more or less graphic forms, and the solution requires bringing individuals and organizations together, to deal with conflict, develop consensus and facilitate actions. The situation prompted us to take initiative, first discussing with local households and the local ranger. Having received the support from the district vice governor, and the attention of the environmental and health officers, we facilitated the development of a joint proposal to generate funding for a conservation and community development project. In 2011, we received funding from the Toyota Foundation. 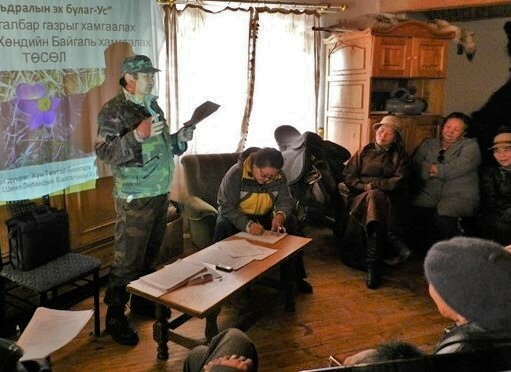 The project brought together local community members, Mongolian NGOs for Environmental Education, researchers on wildlife, forest, pasture and water resources, local law enforcement/rangers, and local government representatives. A series of planning workshops, research and activities followed. 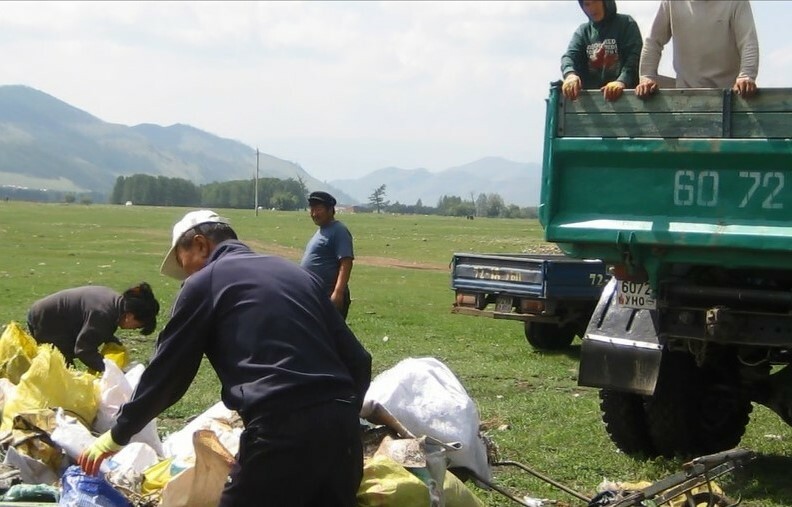 The unhealthy and unsightly gravel-pit-turned-dumpsite was rehabilitated into green pasture, a community effort cleaned the Darkhid valley of rubbish, illegal logging was curbed through community vigilance, natural resources were evaluated and management plans prepared through collaboration of researchers, local resource users and government officers, simple creek restoration measures were initiated, a Comunity Information and Meeting Center was build.Trainings were provided for topics such as improved dairy processing and marketing. 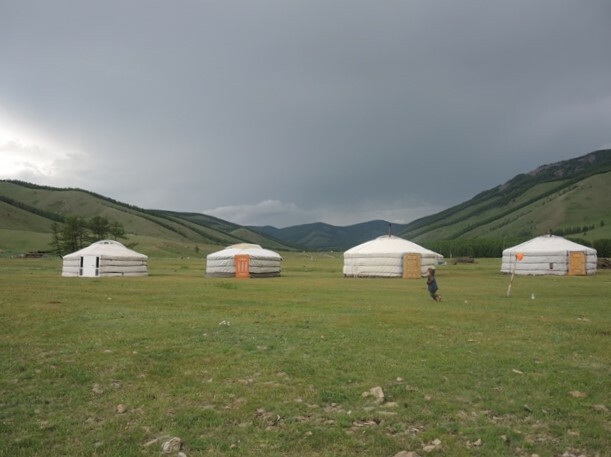 The Mongolian NGO “Nomadic Nature Conservation” (NNC) organized activities for kids to educate about wildlife and ecology and trained local community members as trainers. The group also helped develop an educational trail and accompanying booklet, an interpretive activity and resource to learn about the ecology in the Darkhid Valley. Pasture and water restored for livestock. The Community Information Center, and gers of the Herder Home Stay in the background. 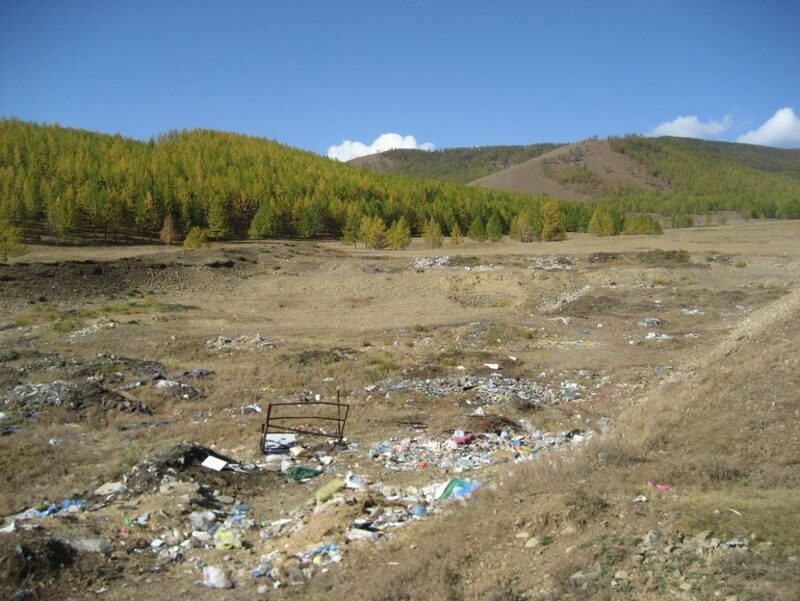 The site of the previous rubbish dump. 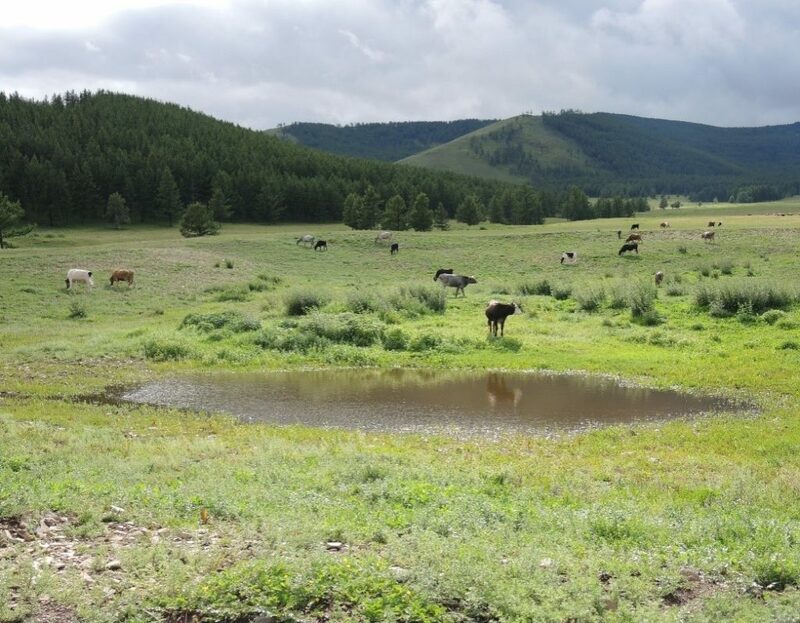 Nature takes charge – vegetation is coming back, a small pond provides water for livestock. Logs placed into the creek bed – simple measures to restore the natural state of water courses and improve water retention. 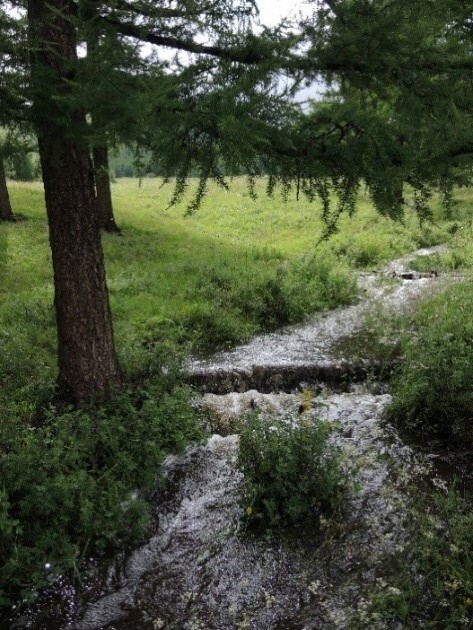 Creek restoration measures. 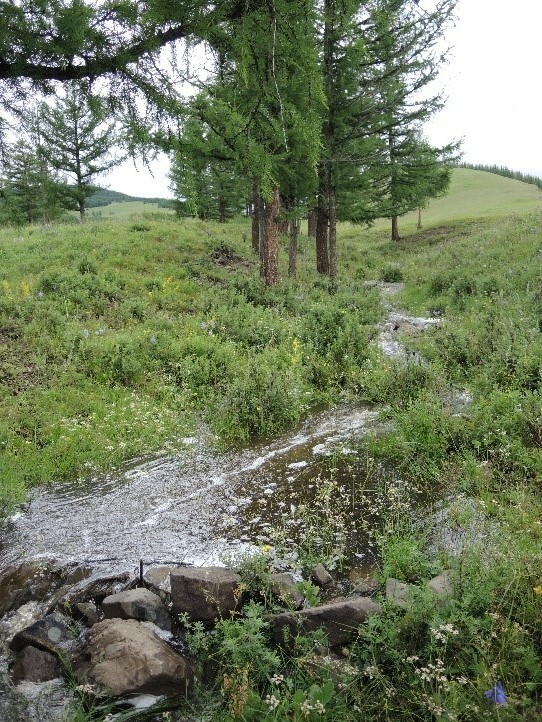 Small dams of rocks built before the spring floods – helping to slow down water run-off, and increasing water retention into the soil and aquifer. 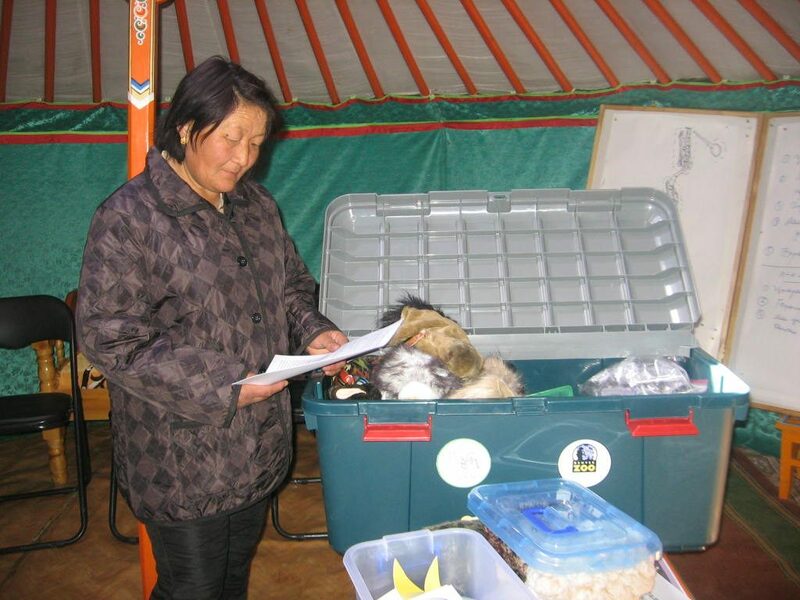 Davasuren, Darkhid Community Leader and Ger Stay Host, with the “Nature Trunk” – for ecological learning activities for kids, and others. These trunks are being introduced in many parts of the country, remaining with local communities, and passed on to other places. A perfect tool for kids of nomads for playful learning about ecology. 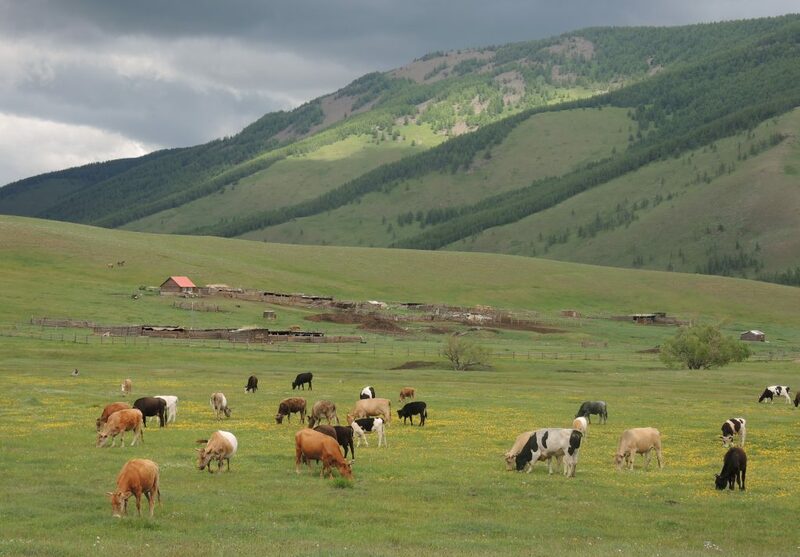 Livestock in the Darkhid Valley, also the home valley of the Stone Horse herd, and of the Herder Home Stay. 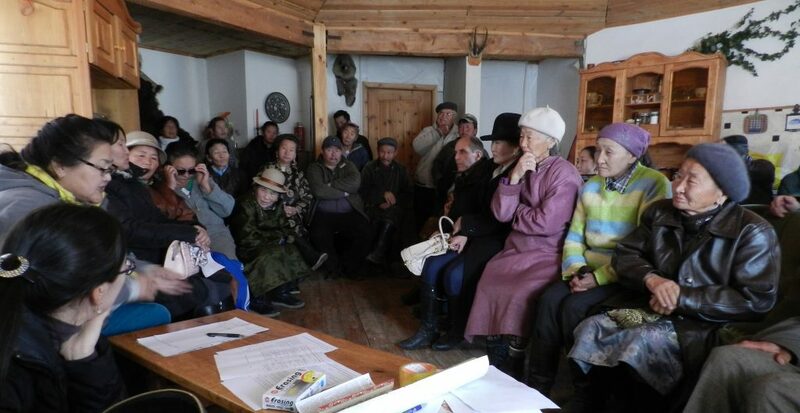 Guest Gers of the Herder Home Stay in the Darkhid Valley during summer. 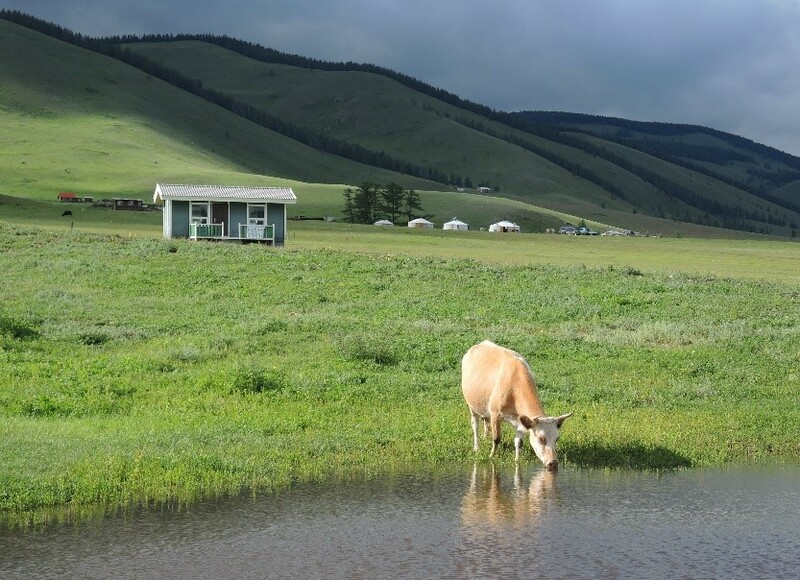 To enjoy the Darkhid Valley and experience daily life of a Mongolian herder family, check out the Ger Stay. See the 2019 Horse Trekking Schedule to find your Ride!